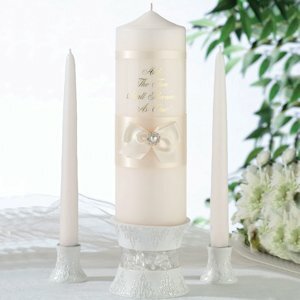 This timelessly beautiful unity candle set will be an important piece in your ceremony that you will be proud to display in your home as a cherished memento after your wedding. The set includes the pillar candle that measures 9" x 3" and the two taper candles measuring 10" tall. The front of the unity candle holds the message "And The Two Shall Become As One" in gold writing and below is a ivory ribbon accented with rhinestones and a pearl. For the stand in the image, please search CH930.